Remember how owl was the "in" animal in fashion few years back? This year, expect to see a lot of lions, all thanks to Chanel who introduced its Le Lion jewelry collection. Today I'm going to show you how to turn your used glass jar into a luxury piece of display jar. It is super simple. If you ever see me posting my Weekend DIY projects, it has to be a simple tutorial. Or else I wouldn't do it. I consider myself a lazy person, so anything that takes a lot of effort to achieve is definitely not my cup of tea. Anyway, is it possible for a lazy person to enjoy doing DIY projects? 2. A toy lion (you can buy this in toy store or you can steal your kid's. If you don't like lion, you can choose any other animals). 3. An empty jar (jam jar, pickle jar, candle jar, or any jar that you have emptied). I'm using my Bath & Body Works candle jar. 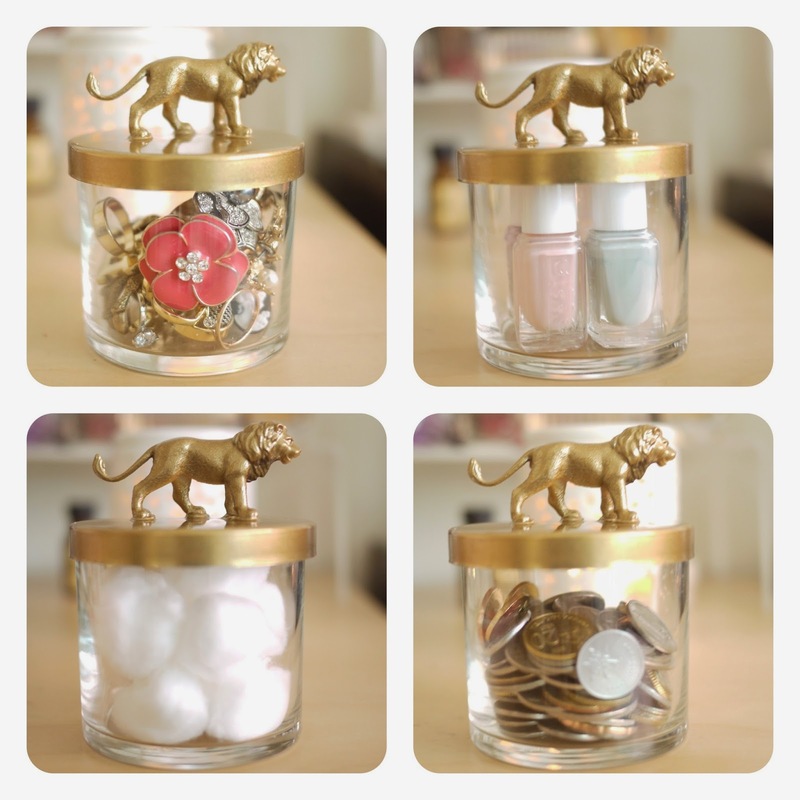 Glue the lion figurine on to the lid of the jar with a glue gun. Spray the lid with the gold spray. Make sure to coat it evenly. You might need 4 coats to cover every part. Leave it to dry about 4 hours. I left it overnight. If you're using jam jar, you can remove the labels and wash it clean. If you're using a candle jar, you might want to depot the wax out of the jar. And this requires some work. First, heat up some water in the pan. The level of the water has to be deeper than the level of the remaining wax in your jar. When the wax is completely melted, pour it into a plastic bag. Sorry, no photo here because it requires a quick hand to do it. Remember to put on your oven glove when reaching for the jar. When the remaining wax gets harden in the plastic bag, turn it over and remove it. You can reuse the wax by burning it in your oil burner. It gave me extra 5 hours. Don't waste it, especially if your candle is expensive. Close the lid you sprayed earlier on to the clean jar, and you're done! There are so many things you can store with the jar - jewelry, nail polish, cotton balls, coins, herbs, candies, etc. What do you think of my Le Lion jar? Do you like it? If you want me to post more DIY ideas, do comment below. I love doing DIY projects on the weekend. However, I only make easy stuff... stuff that don't require a lot of effort because I'm just lazy like that. So nice! I am looking fir that kind of spray too. It can gives a total makeover to anything. @Alicia: There's only one gold tone for the spray. I got it from Popular. I think you can get it from any Popular bookstore.